Saddle: The single saddle towards Greys Peak. How to get there: Take exit Bakerville from I-70 about one hours drive from Denver. Continue up Steven Gulch on a small dirt road (this road was in poor condition, barely passable for a passenger car when we visited.) Park at the end of the road after crossing some private property. Route description: We climbed this peak by a traverse of the saddle from Grays peak. This is also a well marked and easy hike. Alternatively, the mountain can be climbed directly via this saddle. 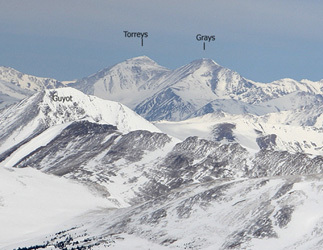 Comments: Torreys Peak looks and is a bit more alpine than Grays. The view is also similar.